PACEMAKER BELFAST 13/03/2017: Heavily armed police squad on the streets of Carrickfergus in the immediate aftermath of the murder of George Gilmore. A man charged with the murder of high-profile loyalist George Gilmore is allegedly linked by a tracking device fitted to his work van, the High Court heard today. Prosecutors also claimed telephone traffic connects Robert Darren McMaw to scouting the victim before he was killed on entering a Carrickfergus estate in an act of bravado. Details emerged as the 32-year-old accused was granted bail over his alleged role in the paramilitary feud-related assassination. McMaw, of Starbog Road in Kilwaughter, near Larne, faces further counts of attempting to murder two of Gilmore’s friends and possessing a gun and ammunition in connection with the attack in March this year. His 29-year-old brother Samuel David McMaw, of the same address, and Brian McLean, 35, from The Birches in Carrickfergus, are also charged with the murder and remain in custody. Gilmore, 44, died after being hit by bullets fired at his car on the Woodburn housing estate in broad daylight in March this year. He had been lured into a trap by his alleged murderers who goaded him into a chase, detectives believe. 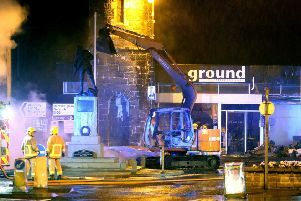 The attack was part of a year-long dispute between Gilmore’s grouping and the UDA’s South East Antrim unit. More than £5 million has been spent on policing the feud. Gilmore was gunned down as he returned with others from attending court in support of friends accused of trying to kill a pub doorman at the Royal Oak bar in the town two days previously. His son, George Junior, was travelling in convoy in a second vehicle. The prosecution claim Samuel David McMaw crouched down in an alleyway, produced a pistol and fired up to eight shots. One bullet went through the windscreen, striking the loyalist in the back of the head. Setting out Darren McMaw’s alleged role, a Crown lawyer said: “He assisted in the location of and tracking of the Gilmore convoy that afternoon. On the day of the attack Darren McMaw travelled from Belfast city centre back to Carrickfergus, parked at McLean’s home and then set off again to a location where he had a clear line of sight of the murder victim’s home, it was claimed. During subsequent police interviews he said he wanted to take a look at Gilmore’s house. Mr Justice Treacy was told detectives believe his brother was with him during part of the journey. A series of telephone calls on the day of the killing, including one to the alleged commander of the South East Antrim UDA, also form part of the investigation. The Gilmores were then seen leaving a bakery in Carrickfergus and heading to the scene of the shooting, according to the prosecution counsel. It was alleged that Darren McMaw phoned his brother to alert him to their movements, before trying to make contact a second time. “However, by that time George Gilmore Senior is already dead, or certainly dying, he’s been shot,” the barrister continued. The court heard Darren McMaw then drove his van “into the eye of storm” by parking near the murder scene. Police later seized the vehicle, with forensic examination said to have established “weak” evidence of cartridge discharge residue particles being found on a passenger seat. Richard McConkey, defending, insisted his client made no attempt to interfere with the investigation following his original arrest in April. He argued that Darren McMaw poses no risk of interfering with the case. “The evidence appears to be taken from a tracking device on a van which police have seized,” he said. Granting bail, Mr Justice Treacy drew a distinction between his circumstances and the two co-accused. He banned Darren McMaw from entering Carrickfergus, imposed a curfew and prohibited any contact with witnesses in the case.